Ayurvedic medicine places great value on the use of oils as nutrients as well as detoxifiers. Massaging of hair and scalp with oils not only improves blood circulation but also strengthens the roots of hair. 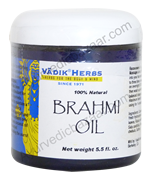 Brahmi Hair Oil, 8 oz. This oil is meant to be massaged into the hair and scalp an hour or more before washing the hair. Gotu kola is nourishing to the hair and helps to strengthen the roots of the hair and to prevent hair loss. Ingredients: Coconut Oil, fresh Hydrocotyle asiatica leaves, Rubia cordifolia, Sida cordifolia, Terminalia chebula, Saffron, Essential oils (for fragrance).